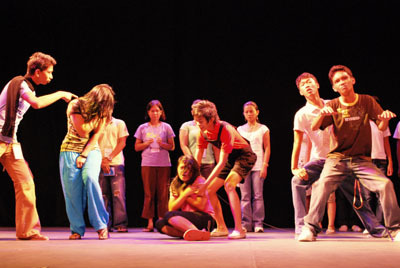 Running from 7 to 15 days, the APTW is an intensive course on PETA’s integrated theater arts method which focuses on improvisational techniques combined with the integrated theater arts processes such as creative drama, visual arts, body movement and dance, sound and music, creative writing and group dynamics. The course is open to all theater practitioners, development workers, educators and individuals interested in using theater processes to draw out the creative power in themselves and in the people they work with. Through group processes and hands-on theater experiences, the participants will be able to create small improvisational pieces using social realities and community and cultural exposures as bases of creation. These pieces form part of the participants’ showcase within the workshop period. The course also includes sharing of PETA’s work and experiences on theater for development and advocacy as well as on theater in education. The PETA School of People’s Theater (SPT) initiated this course in 1997. A group of Japanese artists and educators requested PETA to organize and facilitate a training program in Manila for their group of artists, journalists, teachers, NGO workers, local government workers, human rights advocates and students using PETA’s integrated theater arts process. The training lasted for two weeks and it started an annual training program open to other nationalities. It addressed not only the participants’ developmental needs but also served as an alternative cultural tourism since an essential component of the course is the community and cultural exposure and interaction. The participants were able to use and apply the methods and processes in their respective countries using themes of peace, family communication, gender and sexuality, community development, environmental preservation and cultural heritage, among others. After more than a decade, PETA has enriched the course with new and relevant training content based on PETA’s best work practices in its community, education, developmental and partnership programs in the Philippines and around the world.